I love switching up my nail colour about three times a week. In doing this I end up playing about with the colours and layering them on to create a completely different colour or look. Today I thought I'd share this new combo I'm loving. Think burgundy, subtle gold with a glossy finish. I start off using the Max Factor black nail polish in the colour 'onyx'. 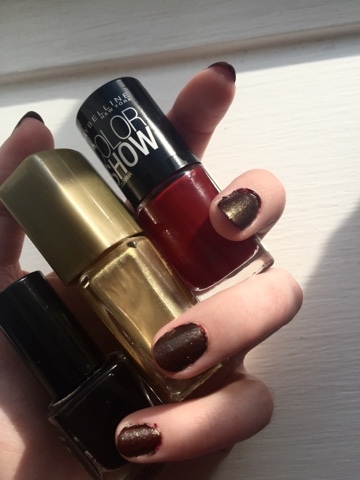 Then, I layer this Maybelline deep red polish to create an even deeper, burgundy red. This polish is the colour 'Downtown Red'. I like this combination on its own so sometimes I leave it there. 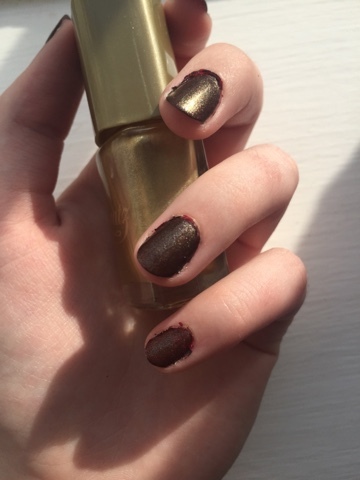 But I recently started adding this very subtle gold shimmer on top of these two colours, recreating my nail colour from my prom. 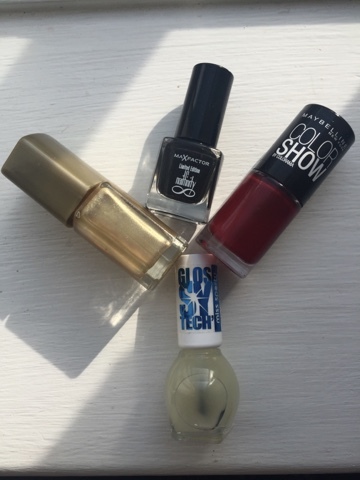 To finish that off, I sweep on a layer of Glossy Tech Finish polish to give a beautiful smooth surface.